Oath of the Gatewatch’s black cards are good. I mean, they are better than good. They are going to define the format I think. There were tons of playable cards in Battle for Zendikar limited, and you can see what black cards I picked out of the set in my previous article. The color is showing no sign of backing down, and the cards from OGW should only serve to make previous archetypes like UB Eldrazi, UB flyers, BR Eldrazi, and BW Lifegain better. There is also the possibility of running mono black + colorless, which could end up being really powerful with the right combination of cards in your pool. You don’t think so? Well, see for yourself. I had quite a hard time deciding what to feature in this article and what not to. There were so many good, playable black cards from OGW to use in limited. I think it’s always good to start off with removal in black. They always tend to have the best removal, and BFZ had no shortage of it between cards like Desolation Grip and Bone Splinters. Oblivion Strike not only gets rid of ANY creature on the battlefield (including Ulamog), but it also is a great card to have if you’re focusing on an Eldrazi processor strategy. This card will go high in draft, so if you open it or get it passed to you grab it. This is great removal for limited. It seems like this card was made to deal with Wasteland Strangler, but regardless of what it was meant for, Tar Snare is an effective card. It deals with creatures from Eldrazi aggro and Rally decks rather well, and because it’s instant speed you’ll also see it being played a lot as a combat trick after blockers are declared. It’s not as good as Oblivion Strike, but I would still grab this in draft. It kills well over 70% of the creatures in the format. You may think that double black casting cost is restrictive, but like I said above, I wouldn’t be surprised to see a mono black eldrazi archetype develop in OGW/BFZ limited. If Tar Snare kills 70% of the creatures in the format, Grasp of Darkness hits around 85% which includes almost all of the flyers. This is an amazing removal spell in limited, and possibly a first pick depending on what your rare is. I’d much rather have strong removal in this block than anything else. This is going to be a limited all-star along with Oblivion Strike. It’s not something you want to play if you’re making a BR Eldrazi or BRW Ally deck, but for every other black deck it’s a godsend against aggro strategies. 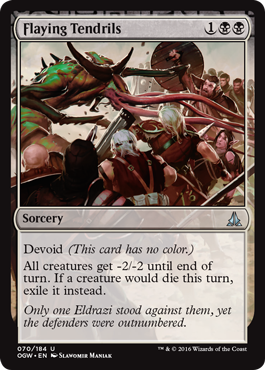 It also works well with the Eldrazi Processor strategy, so load up with removal, exile effects, and big blockers, then throw down your Blight Herders and Ruin Processors to finish off your opponent. Granted it loses some effectiveness against midrange decks, but I think you will realistically hit 2-3 creatures at one time with this effect and exile them. 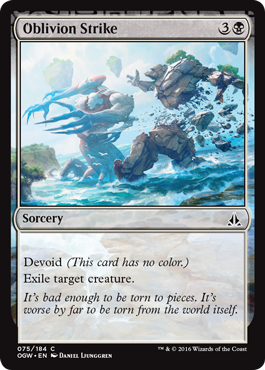 I could even see this card getting played in Modern instead of Drown in Sorrow in sideboards thanks to the exiling effects. Not a first pick in draft, but don’t pass this to the next player unless you’re running the aforementioned Ally or other aggro deck. In Battle for Zendikar there were a decent number of cards based on gaining life as well as ways to gain life. This came together in the BW life gain archetype, and Malakir Soothsayer fits well in that strategy. In fact, it works absolutely perfectly with Drana’s Emissary. At the end of your opponent’s turn tap the Emissary and lose a life to draw a card, then during your upkeep gain it back to be at the same life you were at before with +1 card in hand. She has a great body for fighting, so the ability is just icing on the cake. Malakir Soothsayer will be a roleplayer in both Ally and BW life gain decks. Limited decks usually play anywhere from 13-17 creature cards, so Null Caller will have lots of fodder to play with in your graveyard. If you can protect Null Caller late into the game, his ability will let you win through attrition. Trade early and often in battle with your opponents to get rid of their threats, then slowly overwhelm them with a horde of the walking dead. I’d even consider splashing this card. With Null Caller in play you should be able to switch between offense and defense easily. Limited all star. Continuing with the playable BW/Mardu Ally cards is Zulaport Chainmage. At 4 power and 2 toughness you could classify him as a “glass cannon” that dies to just about anything, but at the same time he can be pumped up by various Ally effects and assuring that your opponent loses 2 life a turn, even on a stalled board is effective. Not that great in non-ally decks, but if you’re playing 4-5 allies in your deck I think you’d want to put in your 23. Otherwise, he might slot in alright in that final, 23rd spot as a vanilla creature with decent stats. I don’t care if I lose a life each turn I use it. Being able to go from 5 mana turn 5 in a black deck to 7 mana turn 6 can be huge. Heck, you can even use the ability the turn it comes into play since you don’t have to tap it. It lets you cheat out finishers like Bane of Bala Ged or Ruin Processors early, and also makes it easier to cast those Eldrazi with the colorless symbol in their abilities. All this on a hard to kill 3/5 body makes it a great card in my book. Add in green’s various Eldrazi Scion generators and BG Eldrazi decks in limited get supercharged. Outside of aggressive Ally decks, any other black deck would love to play him. Very high pick in draft in my opinion. “Mmm the tears of unfathomable sadness. Mmm yummy!”. When you’re draining life from your opponent with not one but FIVE sources (Essence Depleter, Drana’s Emissary, Kalastria Healer, Zulaport Cutthroat, and Zulaport Chainmage) they might just think you’re a sadistic a**hole just like Eric Cartman from South Park. Each of those cards mentioned above could be easily attained in draft, which leads me to believe the really clever players will be able to build some strong BW control decks built around alternate win conditions such as life drain. All they’ll have to do is load up on black and white removal (which is some of the best), throw in a few finishers, and watch as all your hope and dreams drain out of you along with your life. I like the card and think it will be a potent 3 drop in black decks. The more colorless sources you play, the more times you can trigger it each turn! Good early on as a blocker, and a good draw later as a pseudo-finisher that helps you stabilize. How good Kozilek’s Shrieker will be in your deck will depend on the number of colorless sources you play. It could be really strong in a mono black deck, but I think it would be great alongside Gravity Negator in a UB Eldrazi deck as well. This card has great synergy with scion tokens as well, so I could see it dealing a lot of damage in a BG Eldrazi deck if left unblocked. It’s not amazing but the card is effective enough to warrant that your opponent trade with it early to use removal to take it out. Without a lot of colorless sources though it’s probably something you’d play in the final spot of your deck. 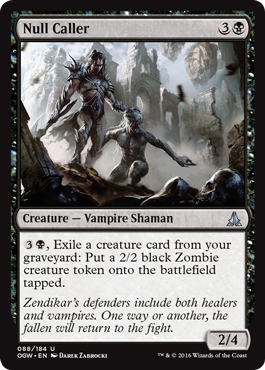 I’m telling you, these types of cards scream mono black/GB Eldrazi with their abilities. This is the closest thing we’ll get to a “Shade” or pumpable creature with Eldrazi typing, and if you’ve played cards like Nanuko Shade in limited before, then you know that they can take over a game rather quickly. If your opponent is out of removal and low on creatures you can power him through turn after turn, pumping him up to force your opponent to block or to tear chunks of life from them. Heck, with 2 activations he can even block and kill that new 5/7 World Ender mythic rare. Not bad for an uncommon. I wouldn’t choose it as my first pick, but if you’re in black you’ll definitely want to play this card. Sky Scourer – I consider this slightly better than the Mist Intruder in blue because you can load up on devoid cards and artifacts to deal some early damage in the air. Not great, but in Eldrazi heavy decks it should be serviceable. 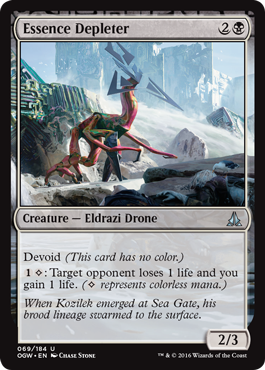 Slaughter Drone – another good Eldrazi “bear” like Culling Drone that works well in aggressive Eldrazi based decks on both defense and offense. It’ll definitely sneak through some damage for you if you have colorless mana available. Witness the End – good against slower decks with lots of haymakers. Also works well if you’re playing a lot of Eldrazi processors. Aside from the sweet artwork, the -2 life is an added bonus as well. Visions of Brutality – this is something you slap on your opponent’s 7 power + finisher and then dare them to attack with. Chump block with an 1/1 token, then let your opponent take 7 damage. Nice variation on the Pacifism effect. Vampire Envoy – this card was made to work with the new Support mechanic, and it gives you a nice bonus for using it to do so. Its typing make it a good choice for ally decks if you’re low on flyers, and its body is big enough to block most of the other flyers your opponent might send your way. Was I right or what? Black’s removal is overpowering in BFZ/OGW limited. There are so many different effects to chose from and they are all pretty effective in their own way. There should be no shortage of playable black cards in a draft pool, but what to do with them is up to you. I personally like what I see in the BG Eldrazi archetype. Big creatures, ramp effects, kill spells. That color combination got a lot better this time around. I also expect the BW Lifegain/Flyers/control strategy to do well this time around as well. This color combination has a little bit of everything, including Awaken spells and board wipes, so I wouldn’t take an opponent playing those colors lightly. BW/BRW Allies should also be decent, but I don’t think that color combination is as strong as the other ones. UB Eldrazi and BR Eldrazi should also benefit from these cards, but I don’t think we’ll see many 3 color Eldrazi decks if people want to ensure that they can play those colorless effects. Mono black + colorless also seems entirely plausible now. If has a great curve, good finishers, lots of removal, card draw, life gain . . . I just think it might be difficult to get a great pool in draft because EVERYBODY will be looking to play that color. You’ll be cut off from both the right and the left. Thanks for reading today’s article and I hope you were able to get some good ideas from it for the pre-release this weekend or for your next OGW/BFZ limited tournament. If you have any comments or come up with any other sweet synergies that I didn’t mention please be sure to mention them down below! Red will be next, hopefully Thursday or early Friday!